It has been so busy at work that I have been at my desk by 7.45am all but one day this week. The reason was partly to do with the Chancellor's Pre-Budget Report on Wednesday. Big business had read the speculation in the run up to the Statement with some trepidation but as one commentator said the day after the City responded with a collective shrug of the shoulders. But having now examined the so-called Green Book it is clear that the rest of us will suffer as this Government has basically run out of ideas to fix the mess that Gordon Brown got us in. · National Insurance hikes on workers meaning a smaller pay packet for anyone earning £20,000 or more. · National Insurance hikes on local firms, making it more expensive to pay staff. · Higher income tax, pushing more middle income earners into the 40 per cent higher rate. · Inheritance tax rises by stealth, taxing people more as house prices start to rise. · Higher stamp duty, meaning the average first time buyer will now pay £1,475 in stamp duty. · A new telephone tax on anyone with a phone or fax line. · Forcing councils to make more cuts to rubbish collections and pushing up council tax. The only impact the Pre-Budget will have is to hike up taxes for the hard working families across Chatham & Aylesford. There was a suggestion that there would be an early Election because the Chancellor and Prime Minister would not want to hold another Budget - good - bring it on because this Labour Government will not doing anything to sort out the worst debt crisis this Country has ever faced. This morning I joined Conservative Councillors Tashi Bhutia and David Wildey and Independent Councillors Tony & Val Goulden at an event to unveil the new display in Luton Library for a Book of Memorial remembering those from Luton who died during the World Wars. The Book was previously hidden away but with help from Cllr Tony Goulden a wonderful display has been built so that the whole community can share the memories. Local resident Don Phillips, who has campaigned for and then practically built the Luton Memorial Meadow, led a minutes silence today for our fallen heroes in all conflicts including Afghanistan and Iraq. It was a touching event and I hope people will make the most of the Book being in the library. Official Government figures have revealed that just ninety pupils across the Country were expelled last year for school bullying, despite a new survey finding half of all 14-year-old children have been bullied. Across Kent, 10 pupils were expelled last year from all state schools. In over two-thirds of local authorities across England, including Medway, not a single child was expelled for bullying. However in Kent 260 pupils and in Medway 40 pupils were suspended from state schools – meaning the disruptive students returned to the school where they caused misery and fear for their classmates. Since 1997, Labour Government rules have deliberately made it more difficult for schools to expel pupils, undermining the authority of head teachers and meaning bullies end up back at the same school as their victims. Bullying makes far too many children’s lives a misery - I have been contacted by parents whose children have been bullied, including being physically beaten up! But the Government’s own figures show that in the vast majority of cases bullies are returned to the same school as their victims after a short punishment, rather than being expelled. I firmly believe that the key to tackling bullying is giving our teachers the powers they need to crack down on bad behaviour. Schools need the power to take a zero tolerance approach towards serious offences such as bullying so that they can maintain discipline in the classroom before it spirals out of control. After an early morning campaign meeting and a quick delivery of newsletters in Larkfield, I went to see two residents who had requested to meet me. The meeting lasted two hours and was fascinating, demonstrated by the fact that 24 hours later I am still thinking about much of what we discussed. Much of the conversation concentrated on religion and in particular Christianity. I consider myself to be a Christian, although I don't go to church very often, and I would never justify my politics through my religious beliefs like Tony Blair and George Bush often did - not least because, as I explained to the residents, my views on social issues are somewhat liberal and therefore contradictory to more conservative Christian views. Our discussion about the unintended impact on religious thought/practices of political and legislative change was very thought provoking. I am glad I took the time to do the meeting - I am sure it will stand me in good stead in the future. Santa visited Snodland this evening, accompanied by the Mayor of Tonbridge & Malling, and the local children (and parents!) had a great time. There must of been at least 200 people singing carols before the sleigh arrived and after the Mayor had finished her rock star moment of waving the mic when the music stopped, conducting the crowd to the rest of "I wish it could be Christmas everyday..." she began the countdown to the switch on of the lights. Santa delayed the departure of the sleigh by insisting on shaking the hands of every small person within an arms length of the sleigh before precariously balancing on a ledge worrying Mrs Claus, who was standing next to me as she watched it return to the Town Hall! Thankfully the rain held off until the fun had finished and all the little children left even more excited about Christmas. I think it is fair to say that Santa loves Snodland, and Snodland most definitely loves Santa!!! I was honoured to be asked to cut a ribbon and officially open the new conservatory of the Robin Hood pub. Landlords Dave and Jo have worked really hard to turn the conservatory into a modern venue with excellent, locally sourced food. As a team we go regularly to the pub for lunch after a morning's canvass so it felt great to be standing in front of their regular Friday afternoon punters and welcome them into the new dining area. Their baby boy was there so I got to kiss a baby too! This morning I joined local councillors and residents in Burham to Bash the Trash. The initiative, which TMBC promotes, has really taken off especially in the villages. I went round the edges of the recreation ground before heading off to join Kent Conservative Future who had come over to help with some canvassing. We had a good team of 20 out in total and finished off in the cafe in Walderslade village for some bacon butties to warm up after. I then popped over to Luton for the Church's Christmas Fayre. It was nice to see how busy it was - fingers crossed I have guessed the right number of sweeties in the jar!!! Off shortly to see Santa and the Mayor turn on the Christmas lights in Snodland and then back home to prepare for an evening in of X Factor (Go Stacey) and emails. The Aylesford Youth Club is going from strength to strength and last night was a demonstration of how successful it has become. Thanks to the hard work of the volunteers and the generosity of Buckmore Park Kart Club, 32 youngsters enjoyed a go-karting session and the internationally successful Kart track. Both Lewis Hamilton and Jenson Button won competitions at the track owned by motor racing legend John Surtees and I think many of the youngsters, both boys and girls, were wondering after if they were going to be a future Formula 1 champion! It wasn't only the kids that enjoyed it! Having been told I was too old to race in a kids kart (which I am!) I thought I was only going to get to sit and watch the fun. But (thankfully for me) one of the 16 year old lads was too big for the kart and since he was old enough to go in an adult kart we both got to have a whizz around the track. It was the fastest 10 minutes ever and Tom, my opponent, managed to save face in front of his mates by not losing to a woman - albeit due to some pretty hilarious cheating...!!! I have raced around Silverstone in an E-type jag before but this was much harder and certainly more raw. In a car you feel safer (for starters you are strapped in) and you know if you crash, roll, spin etc there is at least some metal between you and the track. The kart is open, heavy and fast and very very close to the ground. But in the words of some of the kids last night - it was awesome. To add to the excitement, whilst we were there Buckmore Park Kart Club received notification that it had been awarded third in the whole of the UK in the Motor Sports Association Club of the Year Award. This is wonderful recognition for a club that does so much to promote participation by younger members and has a relationship with Mid Kent College as part of the Lets Go Karting initiative. The Club does a lot to ensure that people who cannot ordinarily afford to participate in motor sports can access schemes in order to open up new avenues to them. The Club also does a lot to help improve literacy and numeracy through schemes as well as teaches vocational skills to some youngsters. My congratulations go to the Club for this well deserved award. Are we about to see some common sense? The Medway photographer "Monaxle" who was arrested earlier in the year under terrorism legislation for basically taking photos has published a post on his website giving an update on the matter. By the looks of it we are about to see some common sense prevail...You can read Alex's post HERE. Education, traffic and active retirement! I have had an excellent 24 hours. I visited Kingfisher primary school in Princes Park yesterday morning and was very impressed by the hard working and dedicated Headmistress and her team. The foundation class is exactly what early years should be about - play and social integration. The school also has a tiny but much needed Sure Start centre and following an afternoon meeting with several Cabinet members of Medway Council, I was able to confirm to the Headmistress that despite the delay on the original timetable, it will be extended early in the New Year. The meeting with portfolio holders was interesting. It is always useful to get an update on some of the current and future issues affecting Medway. Schools were obviously top of the agenda! This morning I had a meeting with a resident about issues in Chatham - it was a very informative meeting and there is lots for me to follow up on with the Council and other organisations. Although whilst getting my car parking ticket I noticed several rats scurrying through piles of litter and food waste and immediately reported it so that it can come and get cleared up and the rats dealt with. And now I've just come back from the inaugural meeting of the Aylesford Active Retirement Association. There were over 90 people in the Capel Morris Centre and it looks like from the opening meeting that it is going to be a well supported group. I rather am rather envious of all the activities they have planned! Now I am about to get into my jeans and head up to Buckmore Park with the Youth Club for an afternoon of go-karting. Watch out the Stig!! Am off from work (Aviva) this week so am spending the week meeting people and organisations that I don't get to see when campaigning is limited to the weekend. Today I met with a gentleman who is lobbying for a Hindu temple/community centre and I have to say he made a very compelling case! After a good lunch in Chimi Changas, I headed off to the Medway Maritime for a meeting with the Chief Executive of the Kent Mental Health Trust followed by an update meeting with the Chairman and Interim Chief Executive of the Medway Maritime Hospital. Both were hugely helpful and am really pleased I blocked out the afternoon to spend time learning more about the challenges facing the local health services. Tomorrow, down to Folkestone for an interview followed by carpet fitters, telecanvassing and dinner with my neighbour! I was alarmed to learn that the small print of Labour’s plans to create a National Care Service reveals they will scrap Attendance Allowance and Disability Living Allowance for pensioners to pay for it. An average £3,400 a year will be snatched away from 2.4 million pensioners – equivalent to a quarter of the average pensioner’s income. In Chatham & Aylesford this would affect a shocking 2,670 pensioners. Attendance Allowance and Disability Living Allowance are based on need; they are not means tested and are intended to cover the extra costs arising from the impact the disability has on the life of the disabled person. The key feature of these benefits is that they can be spent by disabled people how they wish, without restrictions, to best support their individual care needs. It is clear that Gordon Brown has chosen to penalise one of the most vulnerable groups in our society for the sake of another of his eye-catching announcements. As with every Labour initiative, someone has to pay and, as with many of them, it is once again those who are least able to afford it who are hit by Brown. These benefits provide vital support for disabled pensioners, giving them the chance to lead an independent life with the freedom to tailor their care to their needs. Of course, we need to do more to help people with their care costs, but it is completely wrong to do so at the expense of disabled pensioners. David Cameron has made it clear that the Conservatives will protect Chatham & Aylesford's pensioners and fight against Gordon Brown’s plan to scrap benefits for the disabled. This week has been incredibly busy starting with a dinner on Monday to celebrate the retirement of John Blundell, the Director of the Institute of Economic Affairs. David Davis MP and journalist Simon Heffer spoke well about the policies that John has advocated over the years and the impact they have had on global economics. I was lucky enough to be sitting next to two Sky journalists and the future Director, a former Lib Dem staffer, who I think was rather daunted at the task ahead by the end of the evening. Amusingly I was accused of not being a free marketeer after questioning the amount and value of money in football - i.e. was Ronaldo really worth £80m? On Tuesday, I joined the team at the phone bank for some telephone canvassing. My sheet was Larkfield and I had a really positive response, as did my colleagues telephoning in other areas. One chap called me an angel but a huge number of people said "we gotta get this lot out"! The team came away feeling positive and looking forward to next week's session. Watching the Queen open Parliament on Wednesday, I felt embarrassed for her. The State Opening of Parliament is a major constitutional function and yet it felt like it was all about the Labour Party saving itself, not serving the country. Gordon Brown has nothing to offer except a series of half-measures aimed at partisan point-scoring – even Cabinet Ministers admit that their programme is about playing politics not improving people’s lives. There was nothing in the Queen's Speech for the hard working man, woman or family in Chatham & Aylesford. A point, Sir John Stanley MP made as well on Thursday when I went to speak to his Executive Association. I had (have) a dreadful cough and rather rudely disrupted the proceedings with my spluttering before croaking my way through my own speech! Having tweaked my hamstring at training on Wednesday, I felt a tad crocked!! The hamstring isn't feeling too great tonight after delivering our latest newsletter with Tashi to probably the longest road in the constituency - Churchill - before going up to help in Blue Bell Hill. I am however getting lots of sympathy at home so have my feet up watching my sister's best friend from school, captain the England Ladies Rugby team against New Zealand at a rainy Twickerham. Tonight, Chatham & Aylesford Conservatives had its annual dinner at the Larkfield Priory Hotel and we were honoured to have the Conservative Party Chairman Eric Pickles as our guest speaker. Eric gave a thought provoking and inspiring speech about what we need to do to win the next General Election - returning a Conservative MP for Chatham & Aylesford is an essential step on that road to victory. It was a wonderful evening - the food was delicious, the company excellent and we raised vital funds for the campaign ahead. At training last night it was announced that Meridian Girls had won, for the second year running, the silver medal at the Medway Sports Club of the Year awards. The club, and especially the management, deserve nothing less as they all put in hours of voluntary time to make sure that everything runs smoothly. In the meantime my girls are third in the league with a game in hand - we have a crunch game on Sunday against Bearsted...I am not sure it will decide the outcome of the league but it is pretty important!! After training, I went to a charity Rugby match at the Aylesford Bulls between a President's XV and an Army team. The "Poppy Day Match" was played in aid of Help for Heroes and was extremely well attended by supporters of the Club, the Royal British Legion, the Parish Council and local residents. I only managed to get to the last 30 minutes but at least I saw an Aylesford try! I don't know how much the game raised for Help for Heroes but with very persuasive army personnel collecting money from the supporters I imagine it will be a significant sum. I went to two different but very moving Remembrance Services today. This morning I attended the Service at St Peter & St Paul Church where the vicar had invited a serving soldier to address the congregation. The soldier from the Royal Engineers spoke about his time in Iraq and Afghanistan and the loss of two soldiers in his regiment; he then took questions from the children attending the service which ranged from how high had he parachuted from through to did he think there would be a World War III. It was poignant how interested the young children were in him, his uniform and his medals - I saw a beautiful young girl staring in awe at him from her mum's lap and it reminded me of the photographs you see of youngsters looking up at World War II veterans and wondered if today's brave soldiers will be similarly respected in 50 years time. This afternoon I attended the Service at the Royal British Legion Village. Sadly, there were fewer men marching this year but I was told later by Edwin Boorman, President of the local British Legion that there were 250 people at the ceremony. I sat next to some veterans who were shivering as they braved the cold wind in just their jackets with their medals proudly pinned to their chests. It was clear that this Remembrance Service meant more because many had fought in World War II and had lost friends and colleagues. 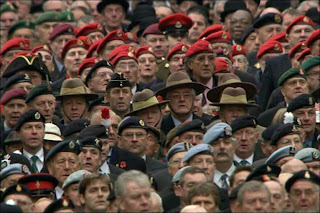 You could hear their voices break when they repeated the words "we will never forget". The sombre ceremony was broken by Squadron Leader Des Butters loudly asking everyone who returned from laying their wreath if they were going for a cup of tea after - Janet, who read a poem during the service, and I found this so surreal that we started to chuckle into our scarves and coats. Des, who wears hearing aids in both ears, was totally oblivious to what he had started. After a Friday night at the Snodland Quiz, it was fabulous to get out in the Saturday winter sunshine to go litter picking in Luton with Tashi and the team. We were planning on meeting at Christchurch and heading up Luton Road, Upper Luton Road and Beacon Road but when we arrived we started speaking to the church steward Dave Boss and decided to concentrate our efforts around the church grounds and its local environment. Within an hour we had filled 10 black bags! I found £10 in a bush which I donated to the church box and Tashi stood in for Tony Goulden who hadn't arrived for his surgery when someone turned up to see him. So all in all it was a good morning! Last night, Rehman Chishti, the PPC for Gillingham, and I were invited to speak to some law students at the University of Kent. Although I read law at University, I never went into practice despite my then-held ambition to become an international maritime lawyer! Instead I was more interested in the constitutional and philosophical side of law and so my political journey began. Reh on the other hand is a practicing barrister so whilst he was able to give them a lengthy insight into what it is like to stand up in front of a judge and what the law and Conservatism have in common, I focused my speech on the time, as Chief of Staff to the then Home Secretary David Davis, I watched a legal and constitutional nightmare unfold - i.e. the passage of the Prevention of Terrorism Bill through Parliament. I spoke of how it felt to be sitting discussing legislation that could have stripped away centuries of civil liberties, enshrined in the Magna Carta, in order to detain suspected terrorists that under legislation would effectively be put under house arrest on the say of a politician not a judge. Anyway I am sure the law students found it more interesting to hear about how to address a judge but I certainly enjoyed talking to them and hope that I bought the constitutional law that they are currently studying to life. The weekend started off with the delivery of my latest newsletter in Aylesford which actually gave me an opportunity to check out the progress of the new crossings on Station Road. The crossings are a hard fought victory for Cllrs Dave Smith and John Balcombe - especially the one at the exit of Medway Court which was supposed to be built at the same time as the estate over 6 years ago. The weather held off yesterday which meant the road surfacing work was speeding along (is it wrong that I love the smell of tar?) so hopefully it will be finished within the few days. After lunch, John and Dave joined me for the first day of the Poppy Appeal stand at Aylesford Sainsbury's. We manned the stand for a good two hours and did a roaring trade - it was not only amazing how many children were encouraging their parents to get a Poppy but also how much people were donating. A few people came over to talk about the report in the paper yesterday regarding the lack of helicopters/military equipment and others mentioned the shocking state of our rehabilitation services. 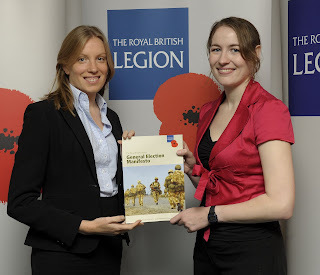 I met with the Royal British Legion recently and pledged "to do my bit" for Service Personnel and their families, the bereaved, veterans and dependants. I hope yesterday I've done that little bit extra for the Appeal. I am absolutely disgusted by the story on the Medway Messenger website regarding outrageous defacing of the Poppy Appeal posters by anti-war protesters. The Poppy Appeal not only raises much needed funding to support current servicemen, women and their families but it reminds us of the heroism of those who fought and died during two World Wars to defend the very freedom that allows people to protest in this country! There is a time and a place for a protest but the defacement of a charity poster to make a political point is not it and I find I am sickened by the disrespectful and thoughtlessness of this act. I hope they are caught and that the guilty party/parties are made to stand alongside veterans on Chatham, Gillingham and Rochester High Streets and made to collect for the Poppy Appeal from now until Remembrance Day. New Luton & Wayfield branch! I have just returned home from the inaugural meeting of our new Luton & Wayfield branch! It is absolutely fabulous to have a branch up and running in what until recently had been a safe Labour ward, which of course returned its first Conservative councillor in decades in the September by-election. In all my time, and those of other political oldies at the meeting, I have never seen so many people actively involved in a branch - even in solid Conservative areas - so I feel very excited tonight by the enthusiasm and interest shown by new and old members alike to ensure the branch successfully contributes to the association and to my campaign. Good luck Luton & Wayfield branch and welcome to the team! What is going on in the X Factor? Danyl in a sing off with Miss Frank. The world has gone mad! KCC AGM and canvassing in the rain! On Friday I attended the Kent County Council Conservative Group AGM followed by the annual lunch with Guest Speaker Michael Howard. It was fascinating to hear what KCC has in story for the next few years although I was horrified to learn that Kent has the highest percentage of drugs misuse in the country. After I left Maidstone I went to see a gentleman in Chatham about the standard of dementia services in Medway. Home visits are one of the most fulfilling parts of the job of being a candidate - it gives you a real opportunity to sit down in a relaxed atmosphere and talk through the issues at length. Carers are too often forgotten but they fulfill a vital role in our society and they need our support more than we can ever fully understand. I will definitely be picking up with the local health providers standards of dementia services when I next meet them. 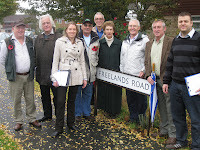 Then on Saturday, we had a large team out in Snodland for a canvass session despite the persistent rain. There were some interesting issues raised on the doorstep this week including Nick Griffin's controversial appearance on BBC Question Time - the whole episode has clearly divided opinion although I think whilst the BNP are a legitimate party whether we like it or not, the BBC were not wrong to give him a slot on the programme. Unless their share of the vote decreases or they are banned by the Government then they will no doubt get other opportunities in the future. Shocking news buried in the unemployment figures released earlier this week for workers in Chatham & Aylesford. This time last year there were 1361 claiming Jobseekers Allowance but now there are a massive 2681 Jobseekers and increase of 97%. But there are only 189 jobs available meaning that there are 14 applicants for every vacancy. As stock markets recover and bankers bonuses return many are predicting an early end to the recession but it is clear that unemployment levels are still rising and that local workers are going to continue to find it very difficult to make ends meet. Unreported from Conference, the Conservatives outlined detailed new plans, to simplify Labour’s numerous and piecemeal work programmes into a single back-to-work programme for everyone on out-of-work benefits. This would be backed up with new and additional work pairings, apprenticeships, further education college places and vocational education for young people. There would also be programmes to support self-employment, work clubs and volunteering opportunities to help people prepare for work and find jobs. Unfortunately it is likely to be six months before Gordon Brown finally calls an election and with national debt rising quickly it looks like it is going to be a rough ride especially for those struggling without a job. The sooner we get rid of this failing Government, the better. Why oh why did Gordon Brown need to take 24 hours to decide what his favourite biscuit is? Asked by mumsnet to name his preferred biscuit, he ignored the question despite being asked a Paxman-esque 12 times! Cameron and Clegg answered with oatcakes (are they biscuits?) and Rich Tea/Hob Nobs but clearly Brown needed to ask his advisers or appeal to focus groups before coming back with "anything with a bit of chocolate". OK, I appreciate that this is not the biggest problem on the Prime Minister's plate but it does show that he is unable to make a decision without dithering first. First he bottled an election and now he has crumbled over a shortbread but what next? The mum's weren't impressed, unsurprisingly. For information my favourite biscuits are pink wafers. I have no idea what that tells you about me but with one of those in my hands I am not sure I would really care!! I have had a quiet weekend politically but a busy one personally! Finally, after months and months of building work, I started moving things into my new house in Aylesford. The painters are still in, the bathroom needs to be tiled and the phone line connected - so it is not all perfect just yet but I have a bed, sofa, kettle, pasta strainer and wine glasses...a few more trips to Ikea and B&Q will no doubt take place over the coming months but I cannot wait to finally put my feet up in front of the TV in the new pad! Following football training tonight, I dashed down to Aylesford Community Centre to catch the last 40 minutes of a public meeting on proposals to defend Aylesford from flooding hosted by the Environment Agency and in conjunction with the County, Borough and Parish Councils. The meeting follows one I organised earlier in the year and it was great to see that the EA have made some progress on proposals to prevent the Aylesford stream flooding again. However the downside is that by the time it takes to get approval, funding, contractors and then the work finished probably means that local residents will be worried every rain storm for a good few years yet! Mind you the Village is some way forward from where we were at the beginning of 2009 and we now have a flood plan which is a very good start and can be found HERE. it enhances Chatham's unsung view. like charcoal drawings, on parade, in ranks. windows reflecting the rising sun. as a brand new day is born. UPDATE: I've since been told that this poem was written by local poet Jim Bell. The BBC is reporting that tomorrow Gordon Brown will announce the sale of UK assets in order to raise £16bn to plug the Treasury black hole. This sale will crucially include the Dartford Crossing; if a private company or investor is going to be interested in buying the assets it will obviously want to make a profit. So if the Dartford Crossing is sold, Kent's commuters crossing the Bridge will continue paying the tolls that should have finished in 2002. Charges were introduced in 1963 to finance building the tunnels and latterly the bridge but were due to end once the debts had been paid off - this happened nearly 7 years ago and instead of the tolls ending, they went up! The proposed sale of the Crossing signals that the charges will now never end and the cash strapped motorist trying to get to work will be the ones that get penalised again. It was great after a month or so of delivering newspapers to get back on the doorsteps canvassing today. Ten of us met in Snodland this morning and spent 2 hours talking to people about their local and national concerns. I love canvassing and think that senior politicians and their advisers should do more door knocking in order to find out what people are really thinking! We didn't find anyone who confessed they were going to vote Labour next time; we did find some (including a former senior Labour activist) who were not going to vote Labour on polling day. I spoke to several public servants who had heard George Osborne and David Cameron's speeches on freezing public sector pay and both recognised that whilst they weren't over the moon at the idea of a pay freeze, they would much rather have a job in a year's time. They did also say that they believed that whichever party won the next election their pay would have been frozen so they thought the openness and honesty of David and George was refreshing. People are still angry about the MP expenses scandal and it seems that the more affected they have been by the recession the more cross they are - and who can blame them? It certainly hasn't been Westminster's finest hour. Immigration is still a hot topic of conversation and the perceived inequity, from housing allocation through to job seeker centres, is still prevalent. A number of people also raised with me the amount of bureaucracy in place today - as one chap said, "how many people do you need to make sure my bin gets collected"? After the week in Manchester with the leadership sending out strong honest messages about how tough the next few years are going to be, it was good to go out in Snodland and be welcomed so warmly; one chap said when I introduced myself as a Conservative "that's alright then luv, I want to belt the other lot" - his chance will come soon enough...at the ballot box in a few months time! My apologies for the blogging break - I am indeed still alive...just! Since I am still working full time for me the political party conference season is about more than just my own party's conference and therefore through work have attended the Liberal Democrat and Labour conferences too, hence the lull in posts. However over the past few weeks I managed to also fit in a wonderful evening speaking to Strood Conservatives, kept up to date with my correspondence and telephone calls, had several meetings with key charities and organisations, finished delivering my latest newsletter, and managed the girls to a 3-1 victory in our second league match of the season! I took today off work and joined Conservative colleagues from across Medway for Freshers Fayre. Today was sports club day and our stand was positioned in between the hockey and cricket stand and across from the netball. There was a lot of ball play going on between the stands and although it was fun trying to dodge cricket balls it was also quite interesting talking to the students. Most would say they aren't interested in politics but once you ask them what they think of the bus service, or crime, or litter they soon realise that they are very interested in politics but just hadn't labelled it as such before. The strangest moment of the day was when Communities Minister Shahid Malik was being shown around the Fayre and the organisers stopped to explain something to him right by our stand. Shahid was very cool and came over to shake my hand but his advisers looked very nervous and were desperate to get the Minister away as soon as possible! After leaving Medway campus I had a meeting with Cllr Nick Chard at Kent County Council about, amongst other things, trying to resolve the problem of traffic on Lower Lunsford Lane. I hope we will get some kind of closure on this issue soon. Britain clocks up debt at a rate of £6,017 per second! Britain is clocking up debt at a rate of £6,017 per second as the Government struggles to balance the books. With tax receipts plummeting because of the recession, state borrowing grew by £16.1 billion last month — almost twice the entire budget for the 2012 Olympics. Net borrowing for the first five months of the financial year stood at £65.3 billion, compared with £26.1 billion at the same stage last year. Total borrowing soared past the £800 billion mark for the first time and total state debt as a proportion of national output reached 57.5 per cent. Just to pay the interest on its ballooning debts the Government must find more than £30 billion a year — about £500 for every man, woman and child in the country. This is incredibly bad news. It is quite clear that the UK's finances are in a shockingly poor state thanks to Labour's total mismanagement of the Treasury books over the past decade. The whole debate around who is going to cut what after a General Election is beginning to miss the point - control over public spending needs to start NOW not in 9 months time! It is deeply regrettable that Medway Council today decided to close St John's and Ridge Meadow Schools in Chatham. The consultation was as a consequence of Government legislation which forces a review of schools who have falling rolls and both St John's and Ridge Meadow fell into this category. Nevertheless both schools achieve good results and were contributing to educational excellence across Medway: it is therefore a shame that this decision has been made. I am not the kind of person that likes to play party politics with a child's education and so I have always made my representation on these proposals in private. I had made it very clear to the portfolio holder that I believe both St John's and Ridge Meadow to be good schools with a strong community base, something that is often under-estimated and devalued in our current education system. I firmly believe that if we don't get primary education right, then we end up playing catch up throughout the rest of a child's education. This is not only unsatisfactory from a learning perspective but also costly. I was also concerned that these proposals are being considered at a time when Government spending on capital projects is being examined in detail and as we know from leaked documents earlier this week that spending could potentially be frozen in light of the huge national debt that this Labour administration has built up. I remain extremely worried that the schools will be closed on a financial promise to invest in other schools which may then not happen. If this were to occur, our children will end up being educated in over-subscribed schools with an infrastructure unable to cope with the demand. I am deeply passionate about ensuring that children across Chatham are given the best chance in life and fundamentally believe that the way to do this is to provide first class facilities, the best teachers, and an environment where they can thrive. Both St John's and Ridge Meadow, in my view, have provided such a base and so I am not going to pretend I am anything other than disappointed with the decision today. The new football season kicked off for Meridian Girls today. I am now manager/coach of the Under 12s having started as coach with many of the same players in the Under 10s - oh how time flies. As you progress through the age groups the game development begins, so this season we play 11-a-side instead of 7, on bigger pitches with larger goals and for a longer time each way. Today we had an away game and an early kick off which was a bit of a shock to the system for those of us who have enjoyed their Sunday morning lie in during the summer break! Our 10 girls (yes we were one short) battled hard against Gravesham and only really lost it in the last 5 minutes when the team understandably began to tire. No points but a happy manager, some very proud parents, and 10 exhausted girls who will no doubt sleep very well tonight!! I am delighted to see that at the next General Election the votes for the Chatham & Aylesford Parliamentary constituency will be counted on the Thursday night and not on the Friday like some other areas. 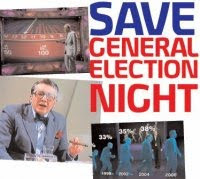 General Election night is sadly under threat which is bad news for voters, politicians and broadcasters alike. You can join the Facebook Campaign to save General Election night HERE. The holiday is definitely over! This morning I met up with members of the team to deliver my new magazine People Talk. It was a hot morning but having put on half a stone over my hols I volunteered to take on some of the steeper areas of Princes Park thinking it would be good for me. Half way through whilst trudging up the 7th house in a row with 15 steps up to the front door, I began to regret my early morning enthusiasm. Ham, egg and chips and two cold glasses of coke at Mickey's Dinner made me feel better though! After a few meetings regarding Meridian Girls, I joined Conservative colleagues at the annual Kites over Capstone event. We managed to get over a hundred more signatures for our petition against plans to build on Capstone Valley as well as marvel at some spectacular kites, including these two giant lizards! After a couple of hours at Kites, we headed to Aylesford for a barbecue arranged at very short notice to celebrate Tashi Bhutia's victory in the Luton & Wayfield by-election on Thursday. After the team's efforts over the past month plus the delivery of a ward-wide thank you letter yesterday, everyone was enjoying sitting down with their burgers and a glass of wine. Tashi made a lovely thank you speech and gave Andrew, his campaign director a beautiful Khukuri sword as a token of his appreciation. As soon as the raffle had finished everyone came to have a look not least because its intricate carvings are stunning. It was obviously a real honour to be given such a gift and Andrew was momentarily speechless - however, I think the next campaign he runs people will think twice about refusing to go out delivering leaflets in the pouring rain!! Anyway it was a wonderful event and one that Tashi, Andrew and the team thoroughly deserved. Now that I have done two suitcases of washing and hung it all out on the line, cleaned the fridge after finding something that once resembled an onion, unpacked the food shopping and popped out to buy a raffle prize for a fundraising event in Aylesford tomorrow, I can sit down and reflect on what has been happening whilst I've been away. Obviously the first thing to do is to say congratulations to Tashi on his fabulous by-election win on Thursday. Luton & Wayfield has not had a Conservative Councillor for over 40 years and so it was a historic victory and one that I do not think local residents will regret. I went canvassing with Tashi a few times before I headed off to France and I genuinely believe that if he applies the energy and enthusiasm to being a councillor as he did on the doorsteps then we will see some pretty swift improvements in the area. Tashi has said he will work closely with Cllrs Tony and Val Goulden, two former Labour Councillors who I like and have previously worked with on a local issue and who now sit as Independents after being cast aside by the local Labour Party. Local Tory blogger Alan Collins carried a post on their resignation but the most interesting part of the post is the comment from Tony and Val's daughter giving the real story. When I heard the news about the Gouldens I rang and left a message on their answer machine - not to gloat or to dig further but simply to check they were ok. Leaving a party you've fought blood, sweat and tears for must be an extremely difficult thing to do and Michelle's comments make it clear how hard it has been for the whole family. So now Luton & Wayfield has a Conservative Councillor ready to work hard and will no doubt get a huge cheer when he enters Gun Wharf next week. I have a new niece! Hannah Sophia was born on Sunday morning in Wellington, New Zealand weighing a healthy 7lbs 3oz. My brother Steve is over the moon with his first baby and I can't wait to meet her when they hopefully return to the UK for a visit over Christmas. Next Saturday, a photo walk will take place as part of a peaceful event to highlight the absurd arrest of local photographer Monaxle under s44 of the Terrorist Act which outlaws people taking photographs of policemen. I can't be there as I head off for my summer break that day but I have sent a message of support and colleagues from Medway Conservatives will be there. I look forward to seeing the photographs of the event. We had 32 people helping Tashi today - surely that must be some sort of council by-election record! As a result we delivered a leaflet to the whole ward and still had enough people left over to do some canvassing in Wayfield. As we regrouped over lunch it was clear that the reception towards Tashi on the doorstep is very positive but we've still got four more weeks canvassing to go. After lunch I went with my sister, younger nephew and niece to see the brilliant and hilarious Ice Age 3 - they had been kicked out because my older nephew was building a hovercraft as part of his summer homework! I don't remember my homework being that fun? Medway Council have approved the budget for a variable message sign for Magpie Hall Road after residents signed my petition for traffic calming measures. 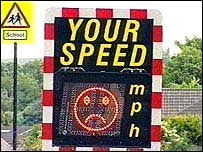 The traffic speeds along the top of Magpie Hall Road and several accidents have been reported as a result. The residents raised this issue with me during a canvass session so I am delighted that we've finally got a result as these signs are proven to slow down traffic and reduce the likelihood of accidents. The new sign should be installed within the next two months. Our Save Capstone Valley petitions have now received nearly 20,000 signatures and it remains one of the top issues raised with us on the doorstep as we continue to canvass in Luton & Wayfield. Tashi and I met local Luton residents at a coffee morning yesterday and it is clear that there is already genuine concern about traffic, school and hospital capacity so a further 9,200 houses is going to have a massive impact on the local infrastructure. So we need to keep the pressure up and make sure that the planning officials know the strength of local feeling against Medway Magna's proposals to build in the Capstone Valley. If you have not yet signed the petition you can do so HERE. When I was young and still able to play a 90 minute game of football without my knees or ankles clicking, I used to dream of headlines of headlines like THIS. 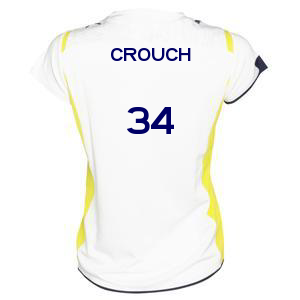 To celebrate Crouch's signing, and my birthday last week, I have just mocked up my new shirt for the season...you better not let me down now Peter!! We had a massive team out today for the launch of Tashi Bhutia's local election campaign in Luton & Wayfield. A by-election has been called for 3rd September after it was revealed that Dennis McFarlane was under investigation for "irregular benefit claims". Tashi, who was in the Brigade of Gurkhas, was selected by the Chatham & Aylesford Conservative Association on Wednesday to be their candidate and today we went out in force to let local residents know that it is time for a change. Most of the team were delivering Tashi's introductory letter but I joined Tashi on the doorsteps canvassing. Out of a whole morning of canvassing we only found one person who said they were a solid Labour voter. There were a number of people who had previously voted Labour who were highly unlikely to do so again and some were very clear as to why - they don't like Gordon Brown, they are fed up with uncontrolled immigration, they were finding things difficult financially, and they certainly didn't like the way Labour treated the Gurkhas! The message on the doorsteps this morning was clear - people felt let down and want a change. We are going to campaign hard to bring change to Luton & Wayfield locally, and then we are going to campaign hard to bring change nationally by winning Chatham & Aylesford at the next General Election. Chatham Conservatives have unanimously selected Tashi Bhutia, a former member of the Brigade of Gurkhas, as their candidate for the forthcoming by election in Luton and Wayfield. 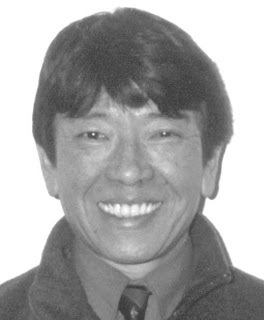 Tashi was born in 1955 and followed his family tradition by joining the Gurkhas. Whilst posted in Hong Kong he met his wife who was serving in the Royal Navy. Following marriage they were posted to Chatham Dockyard in 1980 and have lived in Chatham ever since. Tashi still works in the defence industry as a technician for BAE Systems at Rochester. Tashi Bhutia said, "Whoever is elected to represent Luton and Wayfield needs courage and determination to tackle the problems which often blight this proud community. Combating anti-social behaviour, including drug abuse, binge drinking and the 'yob culture', will be my priority. I will work with anyone, regardless of political party, to do what is right. Chatham has a proud military history as was demonstrated at the recent Armed Forces Day celebration, and that includes a long standing connection with the Brigade of Gurkhas. I am therefore deeply saddened that our Labour MP put his Party above his constituency when he chose to vote with Gordon Brown against the pension rights for retired Gurkhas." Chatham and Aylesford Conservative Parliamentary Spokesman, Tracey Crouch, said "I am delighted to endorse Tashi Bhutia and look forward to working with him in this campaign. Labour have taken urban areas like Luton and Wayfield for granted for far too long. This is a chance for local people to send a message to Gordon Brown: It's Time for Change." I took the day off from work and joined a team of 20 activists on a coach trip to Norwich North for the by-election. We left the Park & Ride in Blue Bell Hill at 9am and arrived in Norwich just after 11.30 to be greeted by Shadow Cabinet Ministers and election co-ordinators. We were immediately given our orders and sent off to a deliver 3000 leaflets about 10 minutes or so from HQ. Having finished in about 90 minutes we stopped for a drink, crisps and a quick read of the paper in the pub where our coach had parked up before heading back to HQ for a next set of orders. Again we disembarked from the coach, were divided into teams and then sent off to various neighbourhoods varying distances from HQ. I was in a team, led by Richard Bacon MP, which had 6 delivery sets but we only managed to get 4 done before our time was up and we needed to head back to the coach. It is difficult to comment on how I feel it is going when we only delivered leaflets and although I spoke to a couple of people (one of whom is traditionally Labour but is so disgusted how the Party treated Ian Gibson he is voting UKIP) the only sense I got was people couldn't wait for the by-election to be over! Although we only spent 6 hours in Norwich, we hope that our little team from Kent have helped Chloe's campaign. We all felt pleased that we'd made the effort to go up and look forward to seeing the result on Friday. Quick - a Tory in the Stocks!! Having spent the morning with my nephews and niece, I popped along to Abbeyfield in St Martin's Square, Larkfield for their summer fete/fun day. The Mayor of Tonbridge & Malling, Cllr Sue Murray opened the event and thankfully during the time we were both there not a drop of rain fell! I had a quick go in the stocks - although to be honest, I wimped out and ducked every time a sponge came any where near me! The young man in the stocks with me (annoyingly I forgot to ask his parents if I could post his picture on my blog) was far braver/crazier than me and got hit by one or two sponges but just laughed and waited for the next one! After the stocks, I moved on to the coconut shy and despite having my eyes closed in the picture actually managed to hit one!! Since I don't have a clue what to do with a coconut I let them keep it! Then I moved to the penalty shoot out - 3 shots for 50p - and this time, having scored a goal, I kept my prize of a packet of Haribo sweets. Back inside I bought two hardback books for 50p - one on Disraeli and one on the Royal Family written by Jeremy Paxman. It was a great little fun day and I hope the weather held off for the rest of the afternoon. UPDATE: I have been contacted by Jamie's mum and I can publish his picture so here is one of the brave little lad preparing to take a sponge in the face for a good cause. Well done Jamie! We've had in the schedule for some time today's canvass session in Luton so it was rather coincidental that earlier this week it was announced that one of Luton's Labour councillor's has resigned his seat, forcing a by-election. I have heard rumours as to why Cllr McFarlane has stepped down, and if true then rightly so, but it was interesting to hear what the general public were thinking of Labour in one of their safest wards! It was a good session although I was desperately sad to knock on the door of a much needed maths teacher who said he was leaving the UK to live in South Africa - it seems he has just had enough and it was easier for him to go there than his lawyer girlfriend coming here! Immigration was mentioned to me more than once on the doorstep this morning and it is quite clear that the longer the issue is ignored by Government, the stronger the anger gets. We went to the Robin Hood for lunch where a wedding party turned up half way through lunch in a fabulous old car. We slipped away quickly and quietly, not wanting to get in the way of the bride and groom's special day. Having been at a 40th birthday party last night, I am off to a 30th birthday party this evening. After an extremely busy week at work, I'm exhausted and would love to spend the night in with my feet up but I am going to pop by to give her my best wishes. 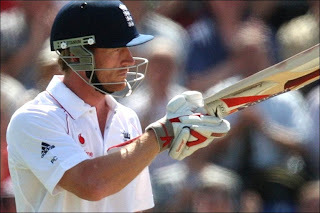 However, my other half has made his excuses and plans to watch the golf/cricket instead! Papers, Planning and Party Time! I started today by meeting the troops in Chatham to deliver my latest newspaper. Despite the fact that it was spitting with rain we managed to get 12 helpers out delivering which was absolutely fantastic. Not only is delivering a great way to keep fit but it is a wonderful way to see roads in the constituency that you normally drive down but rarely walk along - plus it is an excellent way to clock gardening ideas! However once the troops were allocated roads I met with residents in Park Crescent about a planning application. I also met the applicant who I had met during a previous canvass session and who came out to say hello this morning. These things are always very difficult and having been involved in a previous application in Luton where the Council threw the application out only for the Government inspector to come along and disregard the objections and grant the application, these things are never certain. After rejoining my colleagues and delivering the papers, I headed down to Snodland for the annual carnival. I think there were more stalls this year than last and it was nice to catch up with some familiar faces - the bikers on their stand, the cake ladies, Paul in the beer tent and of course the Mayor who this year arrived on a motorbike!! The arrival of the floats was merely the start of the party...it was clear that despite the rain it was going to be a good one! We took time out from our own campaign in Chatham & Aylesford this morning to help colleagues in Rochester & Strood deliver their latest In Touch. It was nice to lend them a hand since they often provide us with help, especially if we have a big delivery, but boy were we hot afterwards. The landlady of the house designated as today's HQ clearly didn't know what had hit her when we all arrived back gasping for cold water, juice and mugs of builders' tea! However, the sandwiches, sausage rolls and mini pork pies all went down very well after our morning of hard work - we'll come back with service like that! I have spent a lovely day with my other half wandering around various events. We started off at the Pottery Market at The Friars in Aylesford. There were potters, sculptors and ceramic artists from across the UK and Europe exhibiting their wares and I was rather tempted by some wonderful vases and a splendid water feature. However, I didn't buy anything today but will certainly go back to the pottery shop once the builders have finished in my house and I can begin to decorate the house with beautiful ceramics more safely! We watched a bit of the Mass before leaving to go to Burham's Fun Day - and jolly good fun it was too. They had all sorts of fairground stalls which would keep children entertained for some time. We were rather amused by some shocking attempts by golf enthusiasts to chip balls into certain holes - one went flying over the top and into a field never to be seen again! It was also good to see Cllr Roger Dalton doing his bit by serving beer to thirsty mums and dads in the Beer Tent! After Burham we headed up to the Robin Hood for their Beer Festival barbecue and lunch time jazz. The Kent beers on offer were fabulous but sadly since I was driving I had to stick to the homemade lemonade - and lovely it was too. It was wonderfully relaxing to sit in a beer garden with the newspaper listening to some live music - who needs Glastonbury?! The day started with the opening of the Aylesford Village Festival and ended with the Red Arrows. Words can't describe how brilliant the air and sea display was on and over the River Medway to celebrate the first Armed Forces Day so instead here is a photo montage of my day.